I read this article and found it very interesting, thought it might be something for you. 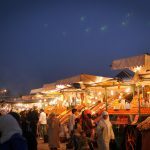 The article is called 15 Nightlife to Enjoy in Marrakech and is located at http://trip-n-travel.com/listicle/22586/. If you’re not a morning person, you’ll love the nightlife in Marrakech. The city is so full of surprises. There are a lot of bars and clubs. And also live music performances in some area of the city. Here are some of the best in town. Theatro is known to be one of the most famous night clubs in Marrakech. There is an entrance fee but in return, you’ll get a free drink. There are casino area and also restaurant area which is much quieter if you don’t like dancing. Go there after 2 am as the club is sometimes still very quiet when it opens at midnight. If you like something unique, go to Mariinski Marrakech. It’s a glamorous Russian club with classy & cozy atmosphere and not to mention great drinks. Male and female dancers wear amazing costumes. And then there’s club music, sometimes they mix it with Russian folk songs. Worth a visit. African Chic is a decent French restaurant that will turn into a club at midnight. So if you have your dinner here and happen to have more time after dinner, why not stay for little longer? They have live music at midnight until around 2 am and after that, there will be DJ taking over the entire place. It’s a formal restaurant with lounge club and dance bar. What more could you ask for? There will be live music and belly dancing every weekend. Sometimes there will be a live performance with fire and candles. It’s great place to end the night. Opens at 7.30 pm every night, Le Comptoir is a great place if you’re looking for a late dinner with entertainment. The food here is awesome. There is a wide range of choices from African food, Moroccan, Mediterranean, European, to Middle Eastern. It started to get busy around 10 pm so if you don’t like the crowds, you might want to arrive earlier. If you’re looking for a nice jazzy place, this is it. Le Bar Churchill is a classic bar that plays old songs at the piano bar. It has a nice interior and decor with red velvet sofas and leopard-print chairs. There is also leather studded walls at the background. Listening to the pianist playing jazz while sipping you favorite cocktail could never go wrong. Are you into electro-dance? Then Pacha Marrakech might be one of your favorite place in town. There are a pool-side lounge and a huge dance hall. And it said to be the Moroccan version of the Ibiza club. Music is awesome and you’ll be surrounded by lots of people. Have fun while the night is still young! If you like French and European food, try to have your dinner here. Restaurant Le Studio might a little small, but it’s a proper one with great atmosphere and service. People seems to love their foie gras so why not try it yourself? They do serve good wines too if you wonder. Drink, DJ, and belly dance. All in one place. Djellabar is a well know club to locals, hence it’s not a very touristy place. The interior itself is a mixed of traditional architecture with a hint of pop art. DJ doesn’t stop spinning until 3 am. Looking for a place to have a romantic dinner? You might consider Sky Lounge at Pearl hotel to be one of your best alternatives. it is open for both visitors and hotel guests. There is area dining area and pool area. It might get a little pricey here, but you’re paying for a decent dinner under the starry sky. So it’s worth it. Thinking about spending the evening at the beach? Head to Nikki beach and enjoy the night. The place is dominated with white daybeds and loungers. And then at the late afternoon, there is a dancing party. As for the food, we recommend that you order their sushi and sashimi. It’s one of the freshest! If you’re looking for a crowded club, go here after 2 pm as most of the time, you won’t find anyone at midnight. After 2pm the club starts to get more exciting with DJ playing a mix of hip hop and Arabic music. If you’re a woman, you might want to check their ladies night as a group of 4 ladies will be able to get a free table with a bottle of drink. What a deal! Royal Mansour Bar is a luxurious place with amazing drinks, food, and performers. You can even have a small private party here. It might get a little bit too expensive but once in a while, you need a special treat. Just sip your drink slowly, and enjoy the night while it lasts. If you’re looking for a place to have dinner having some shisha, this is the place. If you have time, stay a little bit longer until late 1 am the party got going around that time. There will be acrobatic performance, Morrocan rap, and a lot of happy people dancing. Everyone is having their good time! 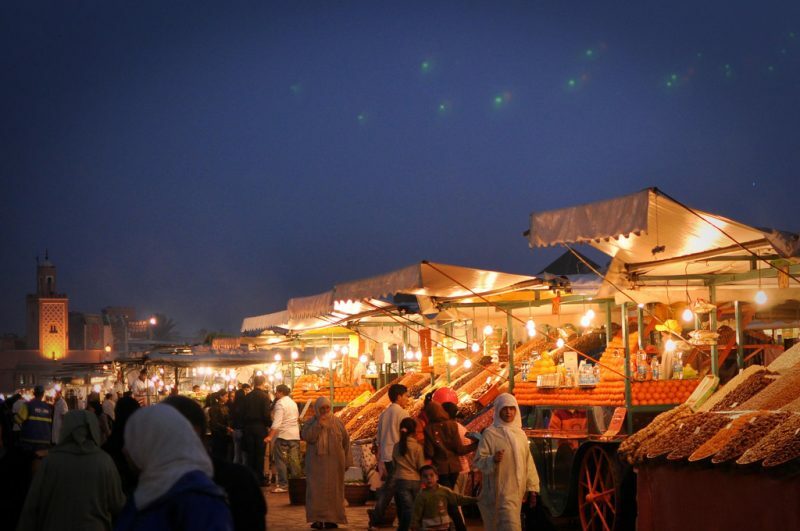 If you’re not into clubs or bars and prefer a local place to go to, why not stroll around Jemaa el-Fnaa? You’ll find lots of local food while enjoying the quiet night at Morocco. And it will surely be one of the best night during your trip.